Smoky Mountain Pizza ~ Eagle. Ground Rules: Everyone has a pen and an organized binder with the agenda and paper in front of them; everyone knows their job descriptions; everyone contributes to the monthly to-do’s; no side conversations; stick to the agenda; start and stop on time; move on if more conversation / research is needed, etc. In person: Karla, Erika, Rebecca, Kari, Kelly, Jessie, Catlin. Call-in: Sarah / Lisa (E) , Abby (N.) District Reps.
Conference Call Equipment: Follow-Up: Erika checked w/ St. Al’s IT re: video call equipment capabilities for improved participation and communication with call-in members available , and good to go . Next meeting will try conference calling at SARMC to include District outreach better. Karla will reserve conference room for next meeting- with video calling equipment available. Maternity room worked well. ISU has also been considered but security was cumbersome. JUMP building was suggested – free parking. Rebecca will look into JUMP and TCCC. Another possibility is Tree City Community Church on Eagle Road, has a kid zone. Use of Google Drive for documents- Erika will double check. Lobbyist: Emailed Caroline Merritt, True North Consulting. Agreed / approved. Waiting for contract from Caroline to sign. IBOL Mtg Update: October 26th, 2018: CE / Supervision. Telehealth to be discussed in 2019. Mel and Kari attended, no new relevant business was presented . Sarah? is in telehealth seeing school district students. Kari will send language to Sarah to get input on any upcoming changes. IBOL Community Member Position: OPEN Dr. McMartin was an idea of Karla, she will figure out how to contact him. IOTA Executive Board Work Day: Need to set a date. January 12, 19 or 26th? 5-6 hours 830-230 on a Saturday . Idea to offer the 1st part of meeting as a Training to review IOTA bylaws. Recruit members and non-members. Jan 26th – proposed to have upcoming Board Meeting as part of that WORK DAY. Please review Job Descriptions/Job Duties/and By-Laws prior to EB work day. update bylaws- certain board positions extending to 2-3 yrs was proposed and looking at “qualifications” required for board positions. Outreach chairs and student reps are invited to join in person, reimbursement is offered for travel. Motion to approve Jan 26 workday- location TBD : Rebecca, Erika second, Approved. Continuing Ed Committee Chair: OPEN, keep looking . Central District Chair: Kristin Biggins resigned. This position is now open. Rebecca is going to network with the district reps in the area to find names of OTs in the area for recruitment. Continuing Education: nothing to report, committee meeting tonight. Advocacy: ALL Contacted an OTP for possible interest. Medicaid Update on Group Therapy: Group ST is covered in all surrounding states. We need someone to research if Group OT is covered. OTs need to create a document to submit to Medicaid stating Group OT code, based on research from states surrounding Idaho. ISU: Requesting letters from IOTA regarding supporting their opening campus in Boise- ACOTE grant pending . ISU asking for a dual curriculum (OTD and MOT) Lisa (at ISU) clarified that state Board of Education is limiting funds for expansion. Letter is due: sooner the better, there is a template. Kari will share template for board to see if anyone can complete that template quickly. Having a local program will double the amt of OTRs in the state, as there is a shortage. 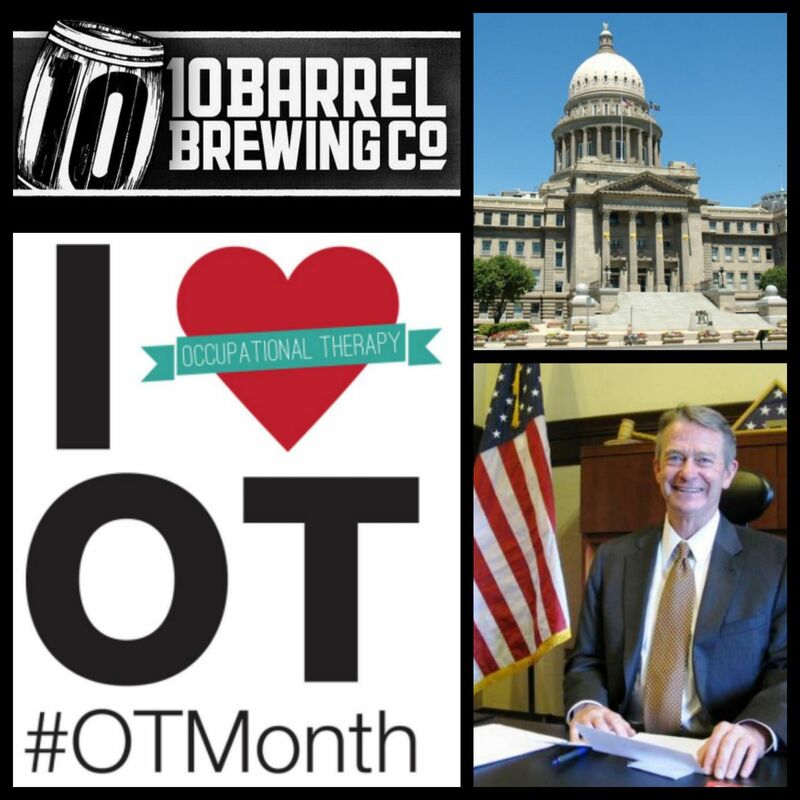 It also strengthens the ISU support of the OT program in Idaho. You can only have one or the other- OTD or MOT occurring at the same time. Legislation/Reimbursement: Mel / Kari – see IBOL above. See above on Medicaid. Update: MOT and OTA Reps discussed possibly holding a competition for student memberships / involvement. Karla will share the link for an AOTA Conf. Call- “Membership- Now what?” on Monday Dec 10 at 6pm MST – with board. South East (Pocatello): Lisa and Sarah– send a picture for IOTA website bios. Clarified a FB page questions- 2 are linked (page and group). Need picture of District Reps. Goals: Continue goal of Meet and Greets and networking, someone from the Board to outreach. Mailers, FB and Website. Newsletter idea… Becki B. looking at a format quarterly send out. Help people understand what people IOTA is doing for them professionally. Mailer in a couple of months. Idea: LEGISLATURE DAY- get a booth at Capitol Rotunda. Karla to look into. Target: April OT Month. Use of app Slack instead of Gmail for IOTA positions / emails- pics, bios, email on website of our dist. reps. Slack APP: helps small groups communication, such as Exec. Board. Exploring this idea. Erika sent an email to the board – with a link to try the app. Representative Assembly: Mel – deferred due to unable to attend this meeting. Mugs / Water Bottles for sale still. Were they put on the website/ Facebook? need to determine shipping, cost, etc. Decided to keep for gifts also. Next EB Meeting Date: Jan 26: 9-2 with executive board meeting time embedded into the workday (1000). Review bylaws prior to workday, Kari will send link, however it is also on website. Time Adjourned: 8: 22 pm. Meeting location: St. Alphonsus Hospital, Coughlin Room 2. Right across from McCleary. Review and approve minutes – on hold; Angela will email last month’s meeting minutes to Mel and it will be distributed to EB Members for approval. Lobbyist: Kari and Mel meeting with Caroline Merritt, True North Consulting, September 5. Becki Stephens Excellence in OT Award. Nominations – 1 so far. Board members please get the word out to other OTPs/coworkers; Christian to send out notification of deadline extension. Continuing Education: Kim – Cherie will present at the IOTA conference re: IBOL updates; please share the information with coworkers; Kari and Karla working on getting the word out to teachers for the writing presentation. Advocacy: Kari – attending Medicaid meetings and advocating for OT coverage. Legislation: Jessie – session is out currently; Karla – both West Ada and Boise moved OTs to certified staff; Karla planning to attend the education committee meeting to ensure rule changes for CE requirements. Outreach: Rebecca/Christina – Erika will ask Christian re: Skype for Business (video conference) abilities to allow district reps to be more involved. Proposing having district reps at the fall conference to hand out color coded ribbons so OTPs will be able to meet other therapists from their region. Ground rules: pen and paper in front of all, to-dos for all, no side conversations, stick to agenda, start and stop on time, move on if more conversation/investigation is needed. MDA: volunteer experience. On the website; will post to the FB page. IBOL Community Member Post: on hold for Sara Poppleton follow-up. Lobbyist: Kari and Mel meeting with Caroline Merritt, True North Consulting. IBOL Mtg: 6/22. Further discussion of CE. Friday @ 9 am; please attend if at all able; will prioritize the meeting to cycle on the main page of our website. Kari will write a letter to the board from IOTA on Supervision and Mel will write a letter re: CE to remind them of what we are supporting. Karla will summarize school therapy CE needs. Becki Stephens Excellence in OT Award. Will discuss and finalize tonight during CE committee meeting. Does IOTA need to improve on conference call equipment? Mel will research STAARS re: changing venue for IOTA meetings for improved conference call capabilities. Plan to complete quarterly newsletter to post on the website; 1st letter in September. Color-coded map of state to clarify what region each therapist is in: Jason. Review and approve minutes: all in favor, none opposed. Swag: Kari ordered and received. Will bring to next meeting as she is OOT. Autumn Hume, executive director MDA: discussed a volunteer opportunity for the MDA Summer Camp being held at the Quaker Hill Camp in McCall, ID, August 4-10. Erika will post the information on the IOTA website for any interested in participating. Does IOTA need to improve on conference call equipment? (Tabled until next meeting d/t time constraints); Becki sent email during meeting detailing difficulties with the current equipment. Tech Committee: Update on website – Erika, Christian: will work to streamline application and payment on website for job postings, CE, and advertising; demonstrated new website and email that will be sent out through Mail Chimp to all IOTA members to sign in and reactivate their membership once the membership spreadsheet is reviewed/verified; will add registration link for the Spring Treatment Summit. IBOL Community Member Post – Sara Poppleton: has contacted Paula Dennis, who is interested; will follow up to see if she has been able to submit her application on the IBOL website. PDUs for IOTA service: 10 hours per reporting period, per rule. Send Mel an email, and he will send the form to you. Kim update: should begin thinking about community members that would best serve on the IBOL board so we are prepared when the position becomes open next year; training that has not been approved through the application process will generally be approved as an inservice and will likely count towards CEUs; discussed streamlining the application process to simplify the 2 year requirement to obtain CEUs. Approved minutes from October 10, 2017 meeting: Motion – Angela Zaugg, Second – Erika Neff; All in favor; non opposed. Some attendees would have preferred to choose courses versus being in an adult or pediatric track only. Decreased student focus during presentations. pen and paper in front of all, to-dos for all, no side conversations, stick to agenda, start and stop on time, move on if more conversation/investigation is needed. Committees should not have to be filled by board members only. As this is a new board, will continue with standard email process and will review in month. Present at monthly meetings if possible as they will be giving membership updates. Possibly will have at a tx summit, no final decision made. One OTR, one OTA in December. Need OTA app.